Are you like me? Do you sometimes struggle to form and manage small groups of writers in the writing workshop? 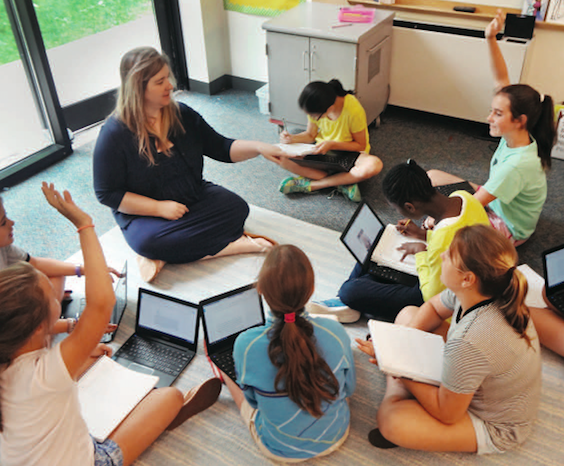 I feel confident conferring one-on-one with my students and teaching the minilesson, however, when it comes to small group work, I can struggle. This is an area that I’ve worked on a lot in the past three years, and I’ve found that flipped learning has helped a lot. Here are 2 scenarios in the writing workshop that illustrate the benefits of using flipped learning in your small groups. Example #1: I’ve just taught a minilesson about a new strategy for elaboration in a persuasive essay. My goals for the remainder of the workshop time are to confer with 3 students and run two small group lessons. The first small group of learners need to learn strategies for writing the opposing viewpoints and rebuttals. The second group of learners need to review a previously-taught lesson about paragraph structure. Prior to using flipped learning in the writing workshop, I might have mismanaged my time by trying to juggle these two small groups of learners, and I would not have had time to confer individually with students. However, with two flipped lessons ready to go, I am able to form the two small groups and help them access flipped lessons about the topics. This way I can confer with one student while the small groups are accessing the flipped lessons. Then I can meet with the small groups to answer any questions they might have and see how they are applying what they learned. After meeting with both small groups, I still have plenty of time to meet with 2 or 3 more students one-on-one. Example #2: I’ve learned from Kate Roberts, co-author of DIY Literacy and Falling in Love with Close Reading, that a great strategy for managing small groups of writers in upper elementary and middle school grades is to write 2 to 3 small group topics on the white board and encourage students to sign up for one of those topics. For instance, I might write “Making your thesis statement stronger and arguable,” “3 Strategies for Elaborating,” and “Transitional Sentence Starters” on the board. Students can choose which topic to sign up for during class that day, or they can choose not to participate in a small group. Flipped learning helped me manage these small group sessions. In the past, I would have struggled to provide enough small group options for all of my learners. I know myself, and I know that trying to run 3 small group sessions is challenging in a writing workshop period. Instead of trying to teach all of the sessions, I write FL next to a session title or titles that have flipped lessons online. This way my students can access the flipped lessons on their own, at a time of their convenience, or with a small group of students in the workshop. We are so proud to announce that our new book, Flip Your Writing Workshop, comes out today! In this new book, we teach you how you can successfully flip your writing workshop. No matter where you are in the process of flipping, we’ll teach you the strategies and techniques you need for creating a flipped writing workshop lesson. If you’re new to flipped learning, no problem. If you’ve been flipping lessons for a while, no problem. We provide examples of flipped lessons that use simple technology and lessons that use more sophisticated technology. Also, we walk you through how you might use flipped lessons throughout a writing workshop unit. From generating ideas to celebrating your students’ final drafts, our book can help you envision how you might use flipped learning in your writing workshop. The day I discovered that my interactive whiteboard could record my lessons was the day I began creating flipped lessons. At that time I was teaching fourth grade and I wanted my students to have access to math lessons during math centers. I began to create two kinds of lessons- ones that reviewed previously-taught concepts and ones that previewed new material. My students loved the lessons, and I was excited. Flipped learning was helping my students review and move ahead at their own pace. Flipped learning isn’t about homework. I realize that many people focus on the use of flipped lessons for homework; however, I’ve found that my students access the flipped lessons during the school day just as much as they do at home. It is about my students learning at their own pace and having more time for what really matters- reading and writing. Here is a sample lesson that I used this year with my fifth graders. It helped my students understand how to use sticky notes in their book. This is a simple, quick lesson, and I used Explain Everything to create it. What I like about having this lesson in my collection of flipped lessons is that my students can refer to it at any time during the school year in case they need a refresher about annotating with sticky notes. I can also reuse it again next year. See what you think and leave me a comment with your thoughts. Originally from Pennsylvania, Dana Johansen is hoping that Punxsutawney Phil will not see his shadow on Feb. 2 and there will be an early spring. In the meantime, she spends her time teaching fifth grade in wintery Connecticut, sitting with her yellow lab on the couch reading YA Lit, and watching the tv show, The Big Bang Theory. She has taught elementary and middle school for fourteen years. Dana is a doctoral student at Teachers College, Columbia University where she studies blended learning in reading and writing workshop. She is the co-author of the books Teaching Interpretation and Flip Your Writing Workshop.